I think there might be an error in your market yield curve. It should be higher around 2016-2017…. Kevin, that is well spotted! I had cheated a bit as I did just do linear interpolation between 2-year yields and 5-year yields. So yes you are right. I have added the 3-year yield make the graph more correct. Note I assumed that “3-year” is 2017, which of course is not entirely correct either. No problem. 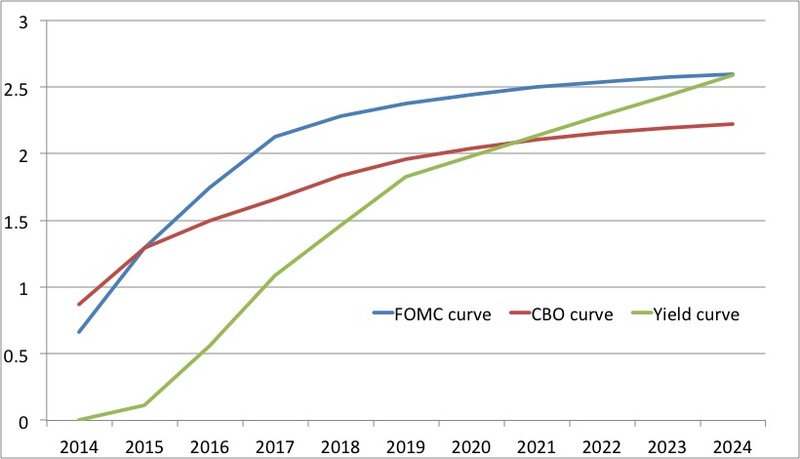 You could use Fed Funds futures prices from CME Group to get even more precise. Your last sentence says it all. It has been demonstrated empirically that low interest rates mean money has been too tight. I wish libertarians in the U.S. would learn this. Pat, so would I! It is paradoxical that people who normally think the market is great is so skeptical about the market pricing. And too bad so many of today’s internet-libertarians never studied Friedman. Kevin, yes I could do that, but then it would be rather about market expectations for the fed is right or wrong rather than about whether there is a bond market bubble. By the way I think that the Fed Funds futures very likely is a better forecast of actual Fed policy than my simulations. After all I have bigger trust in the market than in a simple policy rule for the Fed. If QE caused a bond bubble, why have bond prices risen since the taper began? The bond market (and the TIPS market) are signaling that they don’t expect inflation to exceed 2%. Since the Fed has been targeting inflation of 1-2%, this seems rational. 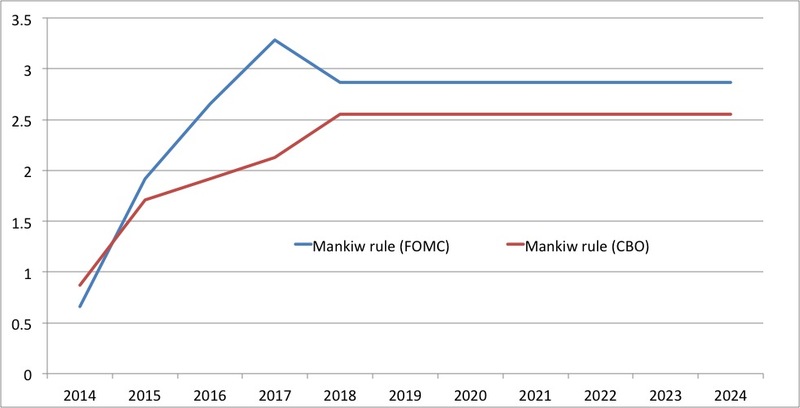 However, as the funds rate rises, I expect V to rise, which will restore the power of M in determining nominal growth, which could–someday–create some unexpected inflation. In any case, the economy should not be run for the benefit of the bond market, and higher inflation is needed if we are ever to see 4% real growth again. Falling bond prices would be a signal of faster growth. OK, guys. Just found this website. And I find it really amazing that you don’t realize there are bubbles everywhere. There is not a single asset that is not a in a bubble. Not one. Starting with real estate, the stock market, private businesses for sale, bonds, profits. Everything is in a bubble. If you think that 4.7 trillion of QE. (approximately the amount of bonds sitting on the Fed’s balance sheet) and zero percent overnight interest rates for over 5 years has not caused mega bubbles, you’ve got to be kidding. Try to sell those 4.7 trillion of bonds in the open market and you will pop the bubble, only then you will get fair market value for your bonds and know what market yields for bonds are. The bond market would crash instantly if the Fed were to sell its 4.7 trillion of bonds it holds. Of course there is a bubble when a Central Bank is holding such a high percentage of all outstanding bonds. Same with everything else. QE has not only affected the US, it has also created a mega housing bubble in Canada. And it has made us all poorer. We al lneed to work longer to buy a house. More years. Wages have been stagnant since 2000, the average wage, and the average price of a house is threefold in Canada. Talk about robbing the population through money printing, negative interest rates, and inflation. North America has become third world as a result of QE and easy money. Everybody is poorer and has to work longer hours for less goods. Land in Kansas has almost tripled since QE started, i recently heard the Kansas Fed chief say. Negative interest rates is a subsidy to businesses and has created a stock market bubble of mega proportions. To be honest with it is so bad that for example in Edmonton the average price of a house used to be the equivalent of 2 years of a Senior Accountant’s salary, right now it requires 6 years of the same Senior Accountant’s salary to purchase a house. if this is not a bubble I don’t what is it.